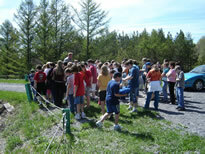 The Altoona Water Authority offers presentation of information to students at many different educational levels (elementary, middle school, high school and college). This information is offered in such a way that students can not only listen but participate and learn valuable information. Topics include the water cycle, water conservation, wastewater, abandoned mine drainage, water treatment, etc. In addition to the classroom, we also offer on-site field trips to our water plants, wastewater plants, abandoned mine drainage projects, reservoirs and watersheds. Chemistry – Explains what water is, how it is made, and how the pH system works. This presentation elaborates on the importance of chemistry for such applications as meeting drinking water requirements. Water Conservation – Focuses on how to conserve water and takes a look at fresh water while showing an appreciation for our clean water and how devastating a drought can be. Where Your Water Comes From – Elaborates on the water cycle, ground water, surface water, and offers facts about the AWA’s system. Littering and Floods – A visual presentation that shows many pictures of what happens when accumulated litter gets caught in our city’s drainage system and the flooding that results. For the Teachers, the Altoona Water Authority provides a Tap Water Kit consisting of ready made water lessons meeting Pennsylvania State Academic Standards for Environment and Ecology Science and Technology.